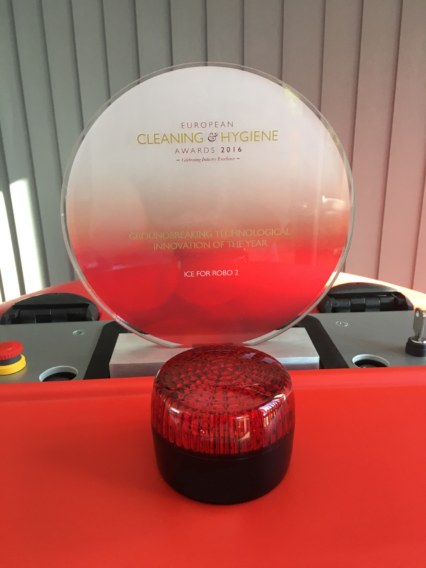 Robo 2 wins European Cleaning… | Industrial Cleaning Equipment Ltd.
We are absolutely thrilled to have won a 2016 European Cleaning and Hygiene Award! Our Robo 2 won the ‘Groundbreaking Technological Innovation of the Year’ category, beating stiff competition from other fantastic innovations. We are delighted to be declared winners, and would like to thank the European Cleaning Journal for hosting a fantastic awards ceremony! ICE have been at the forefront of developing robotic cleaning machines for the past 7 years, and we are extremely proud to be leading the market with the award-winning Robo 2, which was officially launched in May 2016. The Robo 2 is the most advanced fully autonomous cleaning machine in the world. It is the only machine of its kind that will clean complex areas, thanks to its unique laser and sensor technology. It offers unlimited cleaning patterns, and consistent cleaning right up to the edge, and out-performs any other robotic machine when cleaning tight corners, edges and complex rooms. The Robo 2 is ideal for a wide range of environments including hospitals and healthcare facilities; schools, colleges and universities; food and high street retail stores; airports and train stations; and warehouse and manufacturing facilities. The award-winning Robo 2 is available now with guaranteed savings and efficiencies of up to 50%!